Chief Cyprian Ikegwuonu, Father of the alleged target of August 6th attack on worshippers at St Philip’s Catholic Church, Ozubulu, Ekwusigo local government area of Anambra. High Chief Aloysius Ikegwuonu was yesterday buried at the parish’s cemetery amidst tight security.Pa Ikegwuonu was one of the 13 victims of the attack in the church, who were felled while worshipping at the church’s morning mass. Officiating priest at the Requiem Mass, Rev Father Don Chidolue, Episcopal Vicar of Ozubulu region who delivered the sermon said that the church decided to bury the deceased in the church, along with other victims at the church’s cemetery as martyrs. Chidolue said Pa Ikegwuonu by virtue of the nature of his death, which occurred right inside the church was a martyr. He said 12 other who also died in the attack had also been proclaimed martyrs. “We buried them together, so that the church will not easily forget them. Chidolue said out of the 13 people that were killed in the attack, nine were buried in the church’s cemetery, while four deceased persons were taken away by their relatives who insisted that their remains be interred in their ancestral home. The priest described Pa Ikegwuonu as a very charitable personality, who like his son, Aloysius impacted in the lives of people of the community. He described giving as one of the ways people can also attract the mercy of God, but called on all present to live a worthy lifestyle that would guarantee them eternity. The burial was conducted amidst tight security as the police command in Awka had earlier hinted that it was deploying security to the area to forestall any attack, especially as those behind the attack had sent further threat to the community if their financial demands were not met. Those buried alongside Pa Ikegwuonu at the cemetery are Mrs. Cecilia Ewim, Chief Hyacinth Oramadike, Mrs Geraldine Obunadike and her daughter; Miss Uchenna Obunadike. Others are; Mrs Pauline Obetta, Mrs Rose Nwabia and little Miss Marycynthia Ughelu who is said to be just a year old. 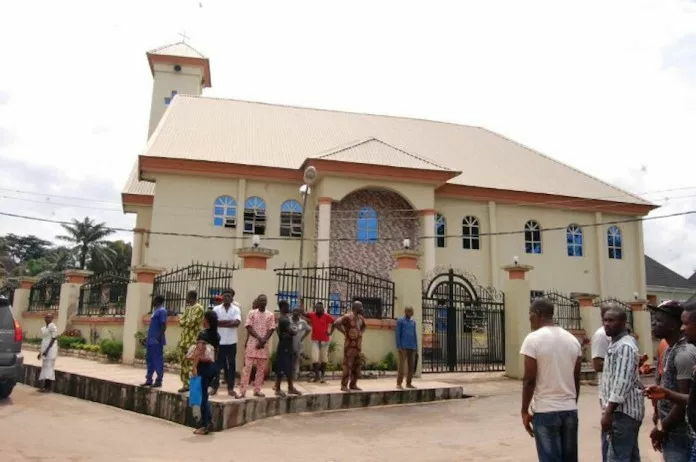 Unknown gun men had in August invaded the church, after allegedly seeking the whereabouts of Aloysius Ikegwuonu in his home, but decided to even their unhappiness on the worshippers who were beneficiaries of Ikegwuonu philanthropy, through the construction of the church. He had however denied having any business dealing with anyone that went awry, to warrant being attacked.